Fffreezing February, a 'spanking' good month! Silly Granddad's 'Pubbin' it Again. Cheer Up, Monday's Granddad's Pub Day! Rusty, One Hell of a Dog. Just a little something to cheer up Monday morning. Grumpy's alternative news. 'Why, are you taking me out?' she said. 'No, I'm going to the pub and I'm turning the heat down.' Now if that's not thoughtful I don't know what is. They were all there, Davey, Harry, One armed Wally plus Wally's lad, Montmerency. Bit modern for us old uns were Montmerency. Mind you, he bought a round, that's got to be a first for our group. 'Ever since his missus found it in the bed' said Wally. He had a right strange haircut 'an all. 'Same haircut as Beckham' said Wally proudly. 'It would be if Stan the belching barber in the Arcade cut it' said Wally. Montmerency came back with the drinks. I could see by his face he'd met Cyril the landlord. Bit of a joker is Cyril, especially with newcomers. 'Told me he'd had Georgia, Cambria, Arial and Frank Ruehi in earlier. Said he wouldn't serve them because they weren't the right type for this pub.' . Poor old Monty, not up to Cyril's humour. Mind you, you need a laugh when Old Davey's around. He never seems to have much luck. 'Have you seen a doctor' I said. 'No, only red spots ' he said. 'Im and his wife's been doing some landscaping in his garden. He rang up Yellow Pages. 'I want a skip outside my house' he said. 'I'm not stopping you' a voice said and put the phone down. They cut a tree down between them. It fell on his missus, damaging her left leg and left arm. She's all right now. He bought a crystal ball to cheer his wife up. When he got it home it were broke. I reckon they saw him coming. Harry were reading the pub paper. Not the Metro like any normal pub. Billy's Weekly Liar it were called. One headline read 'Man kicked to death by spiders' and another 'Unconscious skeleton found on beach.' It's not one for serious reading is Billy's Weekly Liar. There were a piece about a plane crash on a cemetery in Ireland. They reckoned one thousand, three hundred and seventy eight bodies had been recovered so far. Another headline caught the eye. Evidently this highly dangerous midget fortune teller had head butted a guard in the privates and was on the run from prison. It brought tears to the eyes. 'Small Medium at Large' it said. Very succinct. I didn't stay as long as usual. I had a sore throat and I didn't feel over well. I called in the late night chemists. Lovely little thing behind the counter. Hair right down her back. None on her head, just down her back. Bright red dress and strings of beads. Quite perked me up. 'Don't feel well, can you make me something up' I said. 'The Queen's just been in here for some cough mixture' she said. My, there's no flies on her, only beads. 'I knew I could count on you' I said. The wife weren't in too good a mood when I got home. I think she were cold! I knew I'd have to be careful if were to avoid trouble. 'Would you like to go shopping tomorrow, my dear, I'm sure there's something you'd like' I offered. 'Well I need a new bra for a start' she said. 'You've nothing to put in it' I muttered under my breath. Crikey, she's got ears like a hawk. 'Well it doesn't stop you wearing underpants' she hissed. By the heck, she's sharp. 'Let's go to bed, my sweet' I suggested. But she were having non of that either. 'Well, I don't like to wake you' I thought, only this time I kept it to myself. I know when I'm beat! As George used to say, 'Evening all. Serious blogs, who needs them! 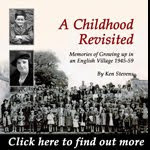 Monday morning blues, banished, Monday's Granddad's pub day! Watch this space. All is Often Not What it Seems, You Never Stop Learning. 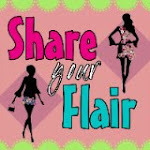 I have done around two hundred blogs. This has turned out to be one of the strangest. Let me tell you why. I came across a piece of writing that impressed me. 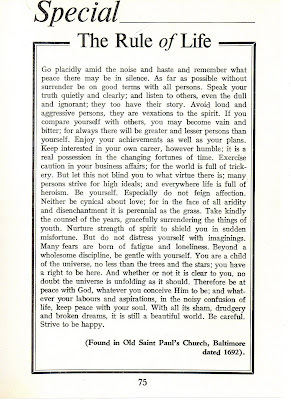 'The Rule of Life' a homily apparently originating from the Old Saint Paul's Church in Baltimore and dated 1692. (I discovered it in a 1972 book called 'Top Pops' Book of Common Sense' by a Mr Neil Prendercost.) I marvelled at the wisdom emanating from all those years ago. I viewed American history in a new light. Another strange twist to the story. I found the original recording by Les Crane. I thought some of you might like to hear it so I pasted it from Utube onto the rough copy of this blog. Lo and behold, it has been removed from both Utube and my rough copy blog by the powers to be, something to do with copyright. (My reproducing it had no financial application plus I marvel at the ability to do such a thing. Amazing, and not a little alarming, this modern technology.) But I found at least two more interpretations you may or may not like. One at least was totally irreverent and I would not wish to offend though neither am I particularly into censorship. Of any case I finished up with two playing simultaneously and unstoppably so! I swear there is something eerily haunting about Desiderata. Hopefully one remains on this blog for your bemused perusal. 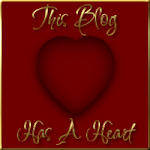 All in all this blog has been an eye opener for me. Any comments very welcome. I would also love to know how many of my readers, particularly in the USA knew Desiderata was not all that it seemed. And despite everything I consider 'Desiderata' well worth reading, despite its checkered history. Follow up to blog dated 6th January 2010. Rusty, aged sixteen, settled into his new home. Amazingly young in spirit, Rusty courted many female dogs in his new area, alas with little success. I doubt he was ever sexually fulfilled in his entire life, but he was still trying to rid himself of his virginity well past nineteen. One weekend a large, black, Labrador-cross walked into our house. Rusty, at eighteen, was beside himself with lust or love. For a complete evening he pursued the object of his desire round and round and round the house. Several times the Christmas tree toppled over as he fought vainly to corner the black stranger. Furniture was upturned, tempers became frayed. Only morning and the return of the stray to her own home brought relief. Rusty was nothing if not persistent. When Rusty first arrived in our household, a scruffy, neglected dog his behaviour was at times bizarre. Particularly strange were his eating habits. We watched in disbelief as he dealt with plates piled high with food. Making no attempt to eat the food, Rusty would propel the plate, pushing, pulling until the plate and its contents nestled in some corner of a room. Not finished, Rusty would search for any items capable of covering the plate and food. Rugs, carpets, newspapers were favourite. Rusty patiently dragged his choice into position until little if anything could be seen. We watched, mesmerised by such behaviour, puzzled by at such strange antics. As time went by, Rusty's strange behaviour lessened, until at last his mealtimes became normal. And the reason for this aberration? Somewhat of a liability, Rusty both amused and alarmed. Attempting to urinate up every tent on a campsite, given the chance was amusing providing we got there in time. Not remotely funny was his indifference to traffic, especially on his courting forays. He was in fact hit seriously early in his life, a second collision with a motor at seventeen years of age would have finished most dogs. 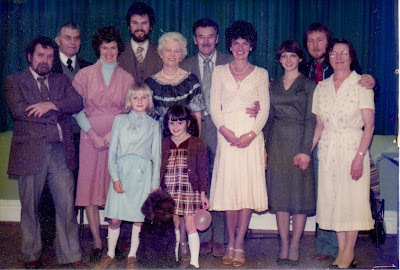 Never the most debonair of dogs, he was idolised by his adopted family (us). Local children grew to love him, though his ever increasing left knacker was a constant source of curiosity. Adults he adored, children over four he tolerated, children under four or thereabouts he mistrusted. Poking fingers he feared and detested, failing eyes made these difficult to avoid. Consequently small children were made to keep their distance by bared teeth and a quiet but authoritative growl that suggested outstretched fingers were not welcome. Cantankerous he could be (woe betide anyone who moved beneath the sheets whilst Rusty lay on the bed,) dangerous or vicious he was not. An Intellectual Offering, or Merely Grumpy Lowering the Tone. I've never fully read Samuel Pepys Diaries so I'm not sure how intellectual they are. When I re-read my 1985 diary I am amazed as to what events I diligently recorded. Of world shattering importance they are not, but, what the heck, they amuse me! I had an accident early in that year, seriously curtailing my activities. It also entailed being 'on the club'. I already suffered from the effects of a motorcycle accident in 1959 so I spent four weeks alternating between physiotherapy and various dinnertime visits to pubs. I know, I know, terrible but I'm older and wiser now. Go on then, older!. The following diary extract gives food for thought. I receive the message that the Cavendish, my 'watering hole' for much of last month, no longer allows dogs in the lounge. I am surprised as this was not the case last month. the reason, it transpires is as follows. The Cavendish, not the most salubrious of pubs has been attempting to 'move upmarket' by selling sandwiches etc at dinnertimes. Ron and friend, two characters not renowned for their sartorial elegance, frequent the pub for hours on end, dinnertime and evening, complete with a large friendly Staffordshire bull terrier. One dinnertime, in the middle of 'sandwiches' someone broke wind, silently but disgustingly effective; sandwiches were discarded. The culprit, it was decided, was Sam, the bull terrier. He was unceremoniously 'outed', a notice now proclaims 'No Dogs Admitted.' Dogs can't talk, but even Sam knows he was not guilty. Old Ron, not unaturally, is saying nothing! Who said they did not wish to know that! I am very pleased that I have readers from abroad as well as our own fair isles so for starters here's a little for them. How many noticed the plight of the Australian hurdler, gold medalist Jana Rawlinson who achieved her wish of having a larger bust, £7,500 implants, only to find it affected her performances. (On the track, naughty naughty!) So the operation was reversed, result, a flat chest once again and hopefully more medals. The good old US of A. Or the couple who have had a snowball in their fridge at Lakeland, Florida since the 1977 snowfall. Taken out proudly on special occasions, the owner, a Mrs Prena Thomas suggested 'It's like a little pet.' There's snow answer to that! So what else caught the eye. We are told the recession is officially over. And just in time, for there are bargains to be had out there. 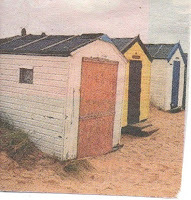 I notice a five by seven foot beach hut is for sale in Southwold for a mere £40,000. The reason its so cheap, the windows broken, the doors missing and it needs repainting. If I were you I'd go for the houseboat Ocean, much bigger and moored at Cadogan Pier near the Albert Bridge in London. Now this one's in good nick, a snip at £1,000,000. I reckon the twerp of the month was Owen Woodgate, an actor playing Prince Charming in the pantomime at Lowestoft. His Twitter post read 'Sh*t hole of a town. Everyone is pregnant. No Starbucks. Hoodies dominate the streets. Poo.' Charming! Was he too surprised that he was booed when he appeared on stage! It's no pantomime either for the prisoners in the Isle of Man jail. Its Europe's only non smoking jail and now teabags are banned because prisoners were smoking them. Talking of criminals, police in Sweden were puzzled as to why thieves were stealing left shoes of designer footwear from displays in Malmo boutiques. Some clever detective work revealed that they were then transported to Denmark where right shoes are traditionally displayed. Paired up correctly with shoes in Copenhagen, seven pairs were worth £900. You couldn't make it up! Finally, does size matter. Please, please, stop sniggering, especially the ladies, its a rhetorical question ! The reason I ask were two items of news that make you think, or is it blink. In Istanbul the worlds largest and the worlds smallest men met for a photo shoot for The Guinness World Records. At 8ft 1 inch and 2ft 5 inches respectively they made an amazingly, if curious couple. I hope those who organise such meetings compensate the pair properly. More in my line is PC Robin Port, a police officer in Tiverton, Devon. I would have loved to have been a policeman, but at 5ft 4 inches in the 1950's, no chance. I was born too early. But now there are no maximum or minimum height requirements. 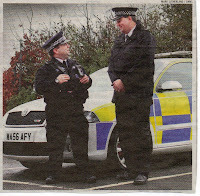 And at 5ft nothing PC Port is Britain's smallest policeman. Good luck to him.